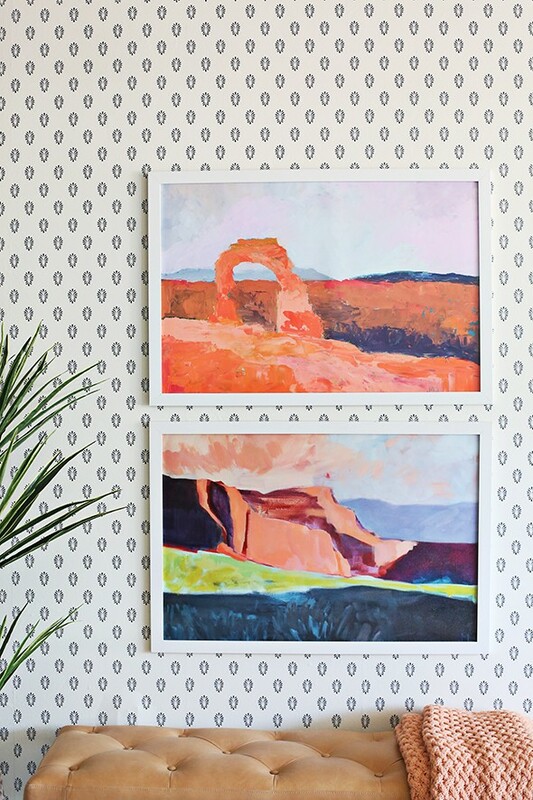 Today we introduced two new prints to the Print Shop from Jenna Marie Ward, Delicate Arch and Capitol Reef! 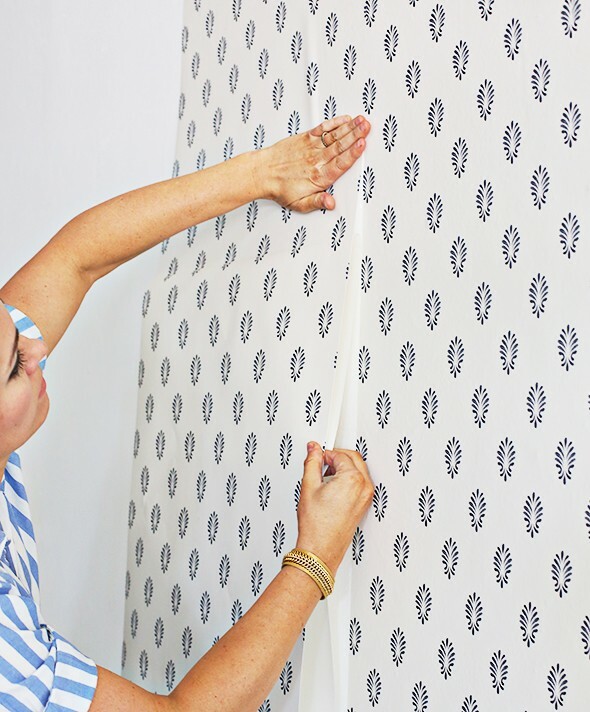 We used the Florida Dilly Indigo Peel & Stick Wallpaper from Target’s new Opalhouse line. The absolute most important part is making sure your lines are level when you start hanging! Don’t start your first piece in a corner because most drywall is not perfectly straight. Either snap a chalkline or use a level to make a floor to ceiling pencil line a few inches away from the corner to start your first roll. 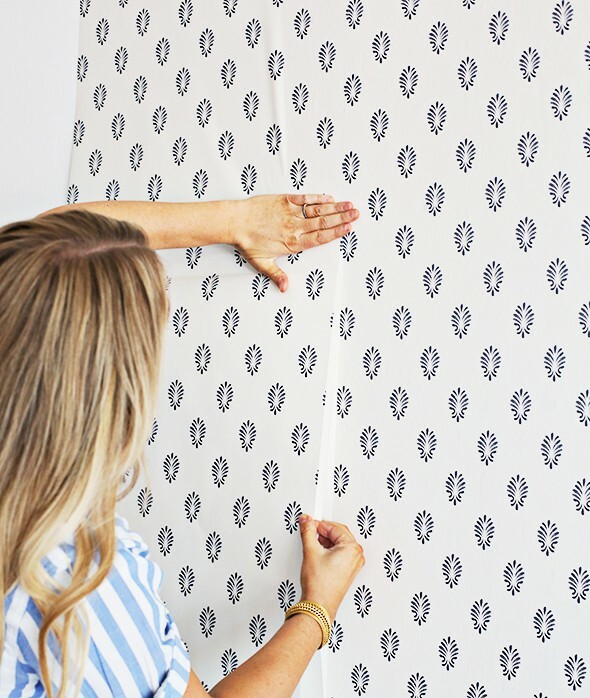 The repositionable wallpaper is SO easy because all you have to worry about is getting the seams to match up, then you can pull up the rest of the paper and smooth out any wrinkles with your arms and hands. You can smooth out any small air bubbles using a credit card or a soft squeegee but there really weren’t that many! So different from pasted wallpaper! Love! Are you able to share the source of the plant basket? Thank you!! If you’re in a rental with “orange peel” walls, would this still stick? I.e. 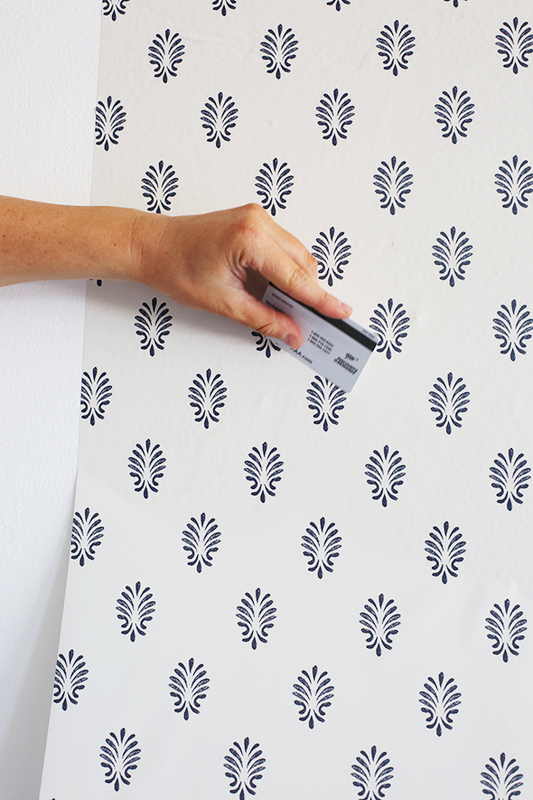 how smooth do your walls need to be? Hi Kara! It depends on the pattern of the paper. 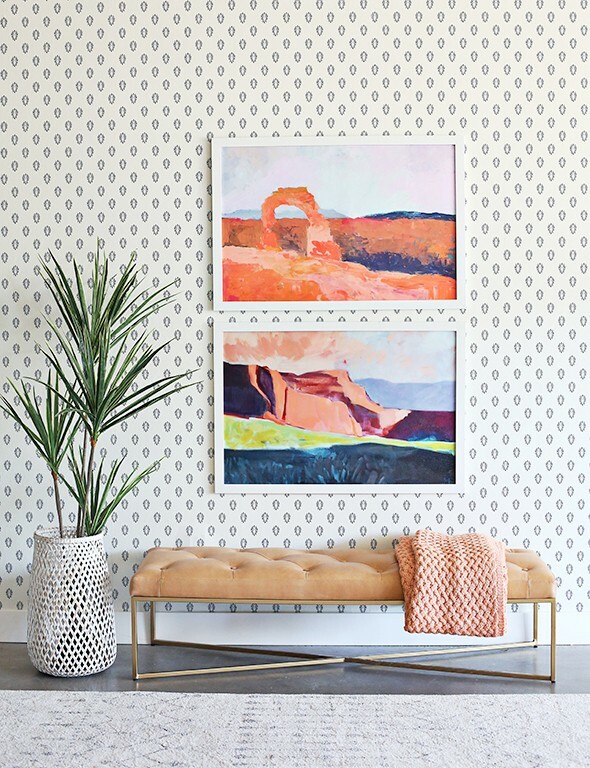 You might be able to get away with a busier patter, but in general it looks better on smooth walls! What size are the images printed in this photo shoot?! So gorgeous. I’m adding them to my cart now! Thank you! Echoing the plant basket source also. Thanks for all the gorgeousness, Jenny! Input on wall texture. I’ve got 1980’s feathered texture on my walls. Would I need to sand down, paint then apply wallpaper? 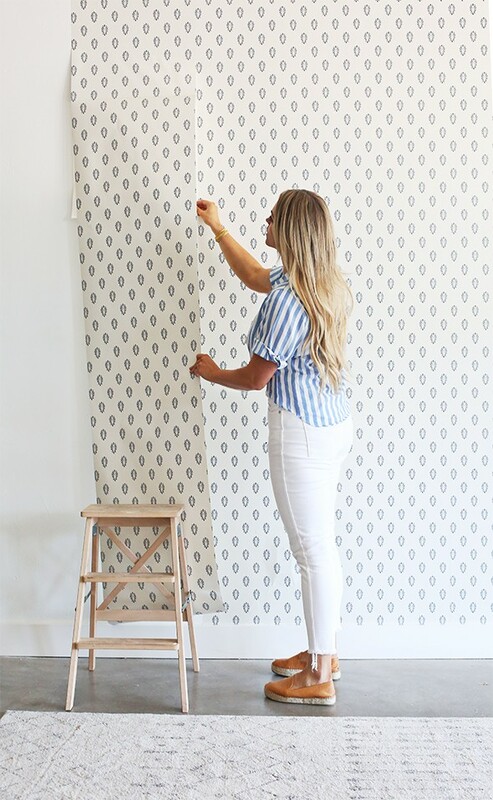 You would probably want to do a smooth coat on your drywall before hanging this specific paper, since the pattern is a little more on the simple side. 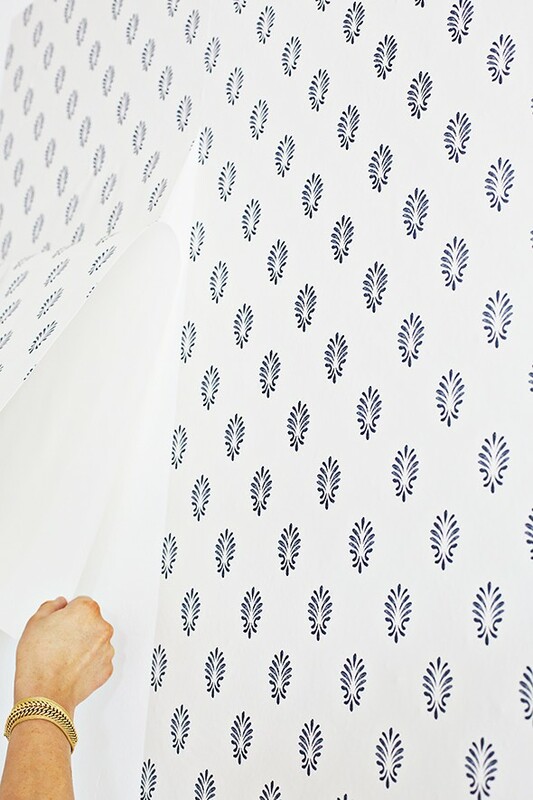 If you pick a paper with a busier pattern, you might be able to get away without changing the texture! 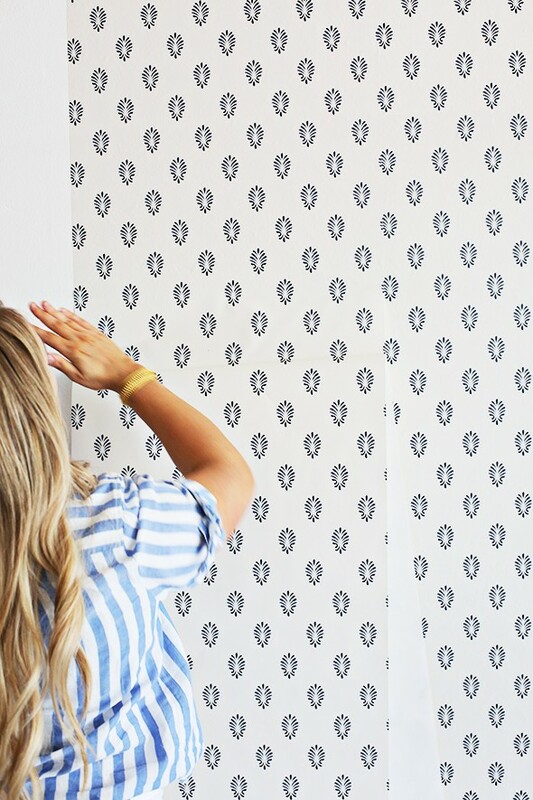 Do you think removable wallpaper would do well in a bathroom? I worry the moisture may start to peel the edges. Yes! I think it would do better than pasted wallpaper probably! My tip is to put an athletic sock on your hand when smoothing out the bubbles…you get the feel of using your hand and can feel the bubbles but no worries about oils or other dirts smearing the paper, and you can easily adjust the pressure because it’s your hand. What a great tip! Love that idea! 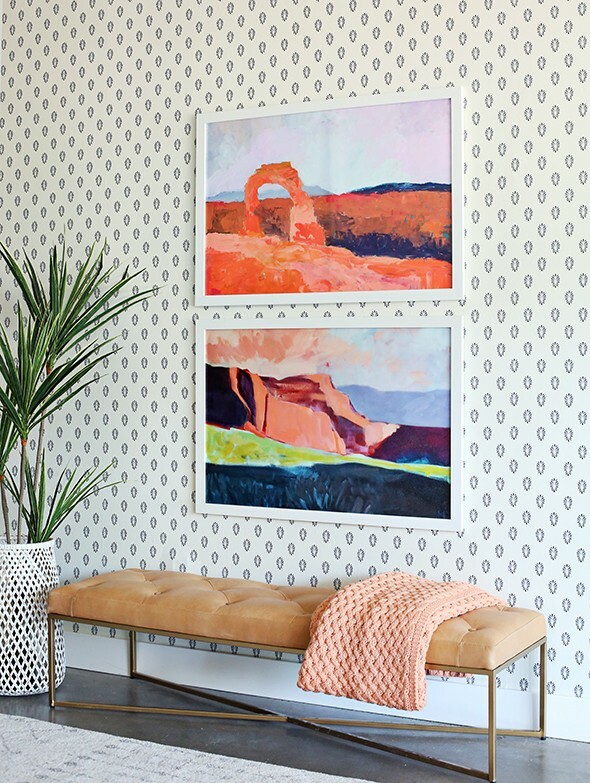 Love this combo of wallpaper with those prints. You are killing it with these new artists you are adding to the shop! LOVE her work! The wallpaper templates you share are very beautiful. I really like these stickers.